We halted at Whistler on our way to Vancouver in August09, 2016. Located in the spectacular Coast Mountains of British Columbia (BC), Whistler is Canada’s favourite year-round destination. 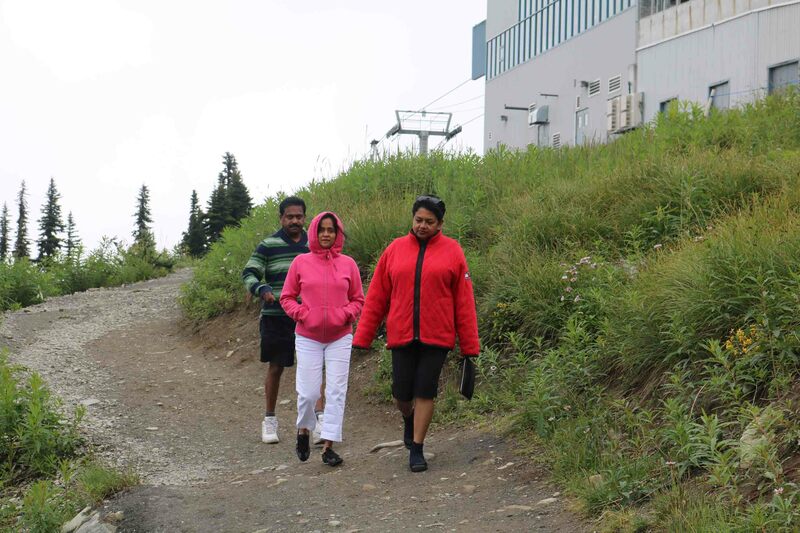 Whistler is undoubtedly the most-visited ski resort in Canada, with over 2 million visitors a year. There are two majestic mountains with a vibrant base Village. The facilities in the area include skiing and snowboarding, gondolas connecting various peaks, mountain biking trails, hiking trails, golf courses, restaurants, bars and accommodation to suit every budget. It is undoubtedly the best mountain adventure site in the world. We headed straight to the Whistler Village Centre to buy our tickets for the Peak2Peak Gondola Ride. The area was jostling with activity, mainly by hikers and mountain bike riders. There were many stalls offering mountain bike rentals and training for novice mountain bikers. The mountain bike trainees ranged in age from five to over 50 years. 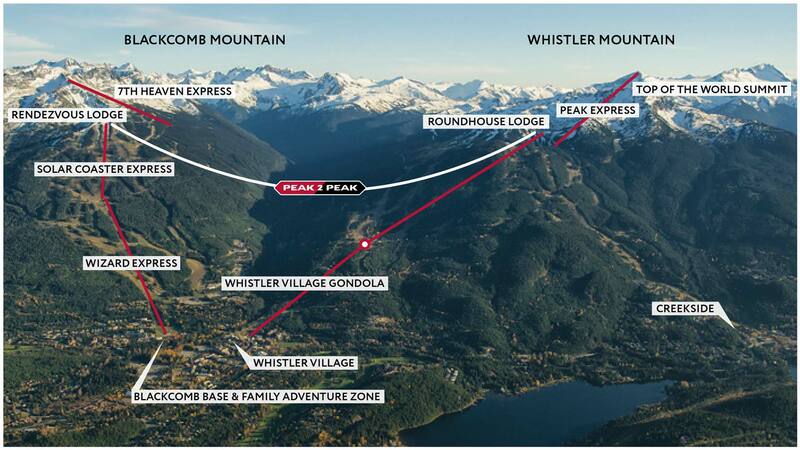 Whistler Blackcomb boasts of the largest mountain bike park in North America, officially opening in May each year. With over 4,900 vertical feet and over 60 descending trails spread over three riding zones, there is something to pump up the adrenaline for each level of riders. 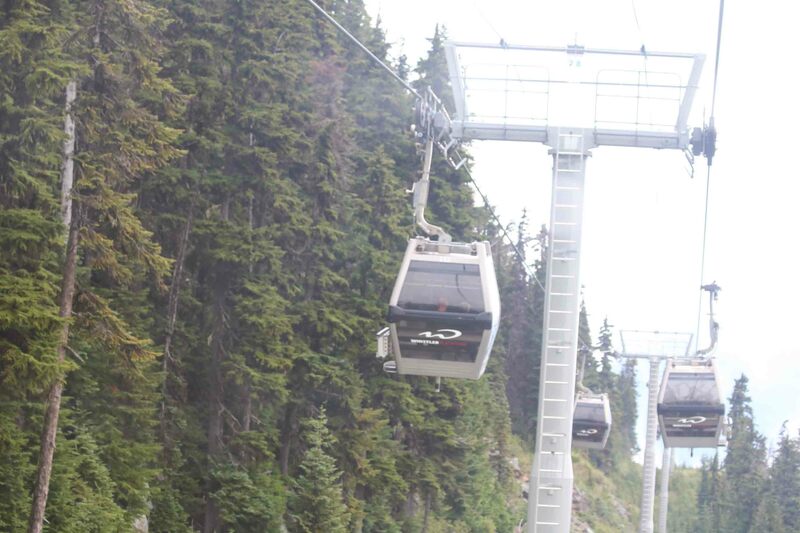 The gondolas of Whistler Blackcomb are inspired by the ski lifts in Switzerland. They connect the two ridge-lines running roughly Northwest to Southeast, separated by a deep valley as shown in the diagram above. 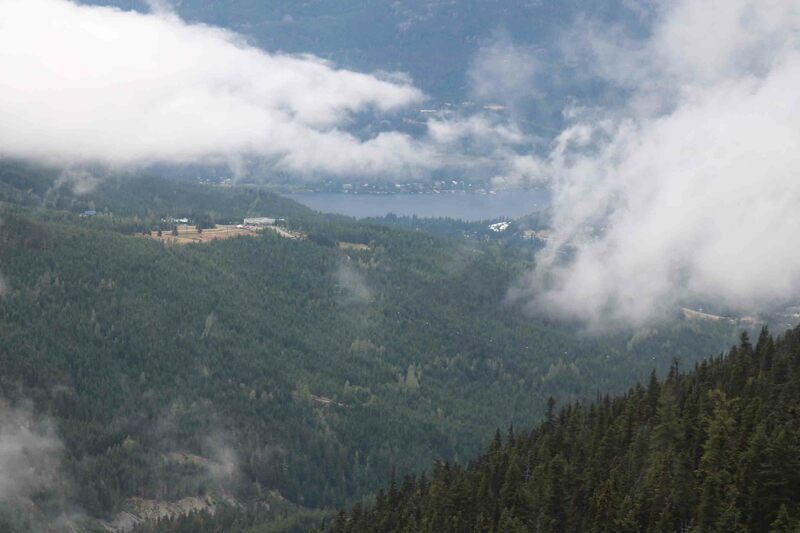 Whistler was originally conceived as part of a Canadian bid for the 1968 Winter Olympics. Although they lost the bid, construction started and the resort opened for the first time in January 1966. Blackcomb mountain, originally a separate entity, opened for business in December 1980. The two resorts underwent a period of intense rivalry through the 1980s and 90s. Intrawest, the BC real estate firm that developed Blackcomb, purchased Whistler and fully merged their operations in 2003. 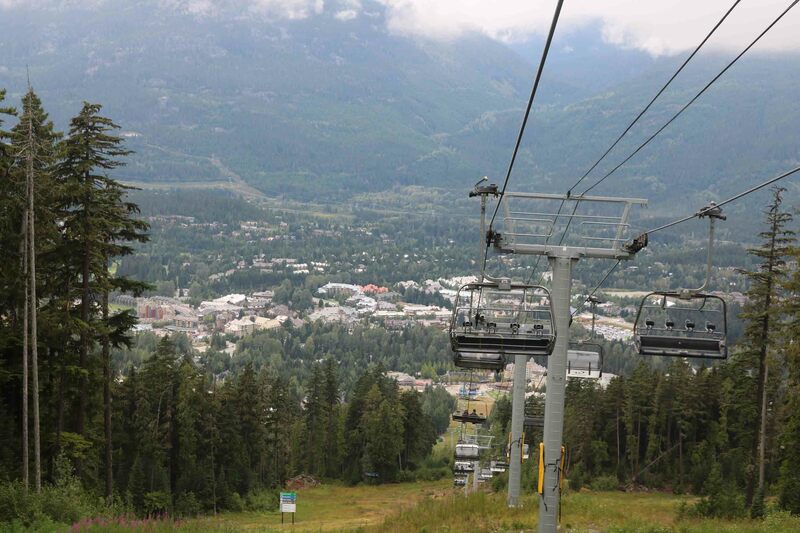 Whistler Blackcomb offered a renewed bid for the 2010 Winter Olympics, which they won in July 2003. They hosted the men’s and women’s Olympic and Paralympic alpine skiing events. Over the next decade, Intrawest expanded by purchasing additional ski resorts across North America, before expanding into golf and other resorts as well. We lined up at the Whistler Village Centre for our journey up Whistler Mountain. The air was a bit chilly and misty. The gondolas were enclosed, separate for persons and equipment. Many mountain bike enthusiasts and tourists were already in queue awaiting their turns. 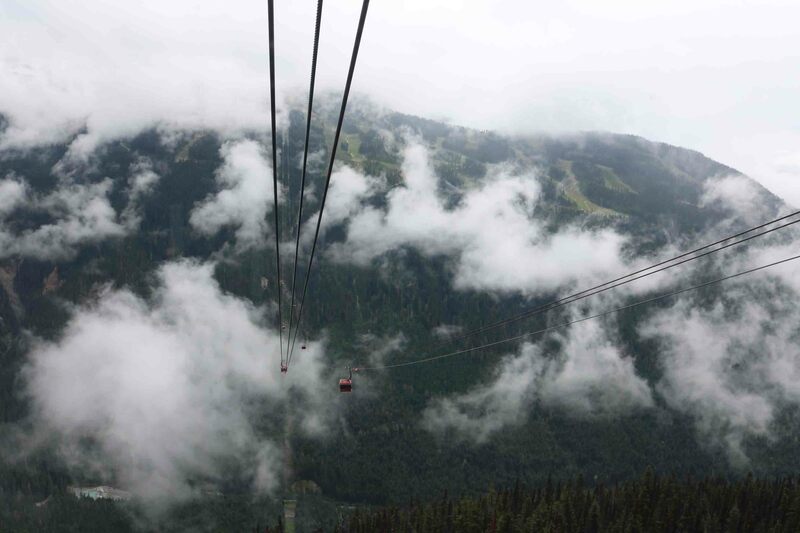 We boarded our gondola for the first leg and the journey up the Whistler Mountain to the Roundhouse Lodge located at about 6,000 feet. 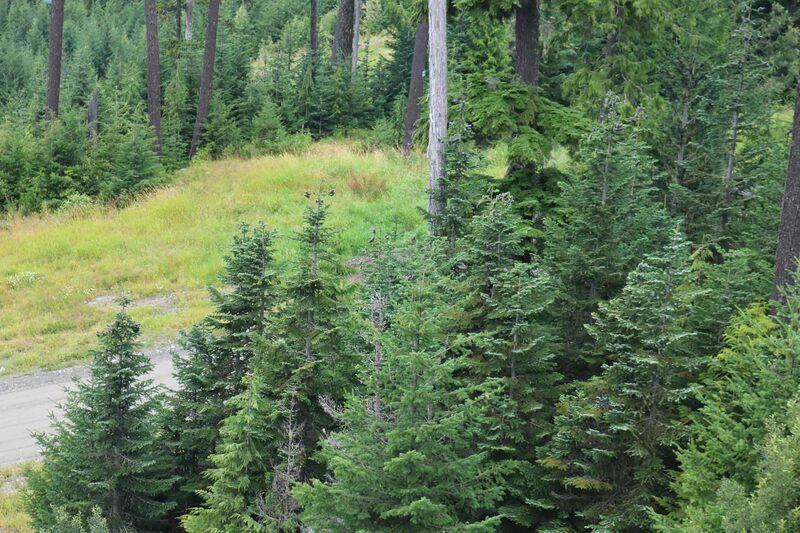 Enroute we had a fascinating view of the coniferous tree tops with their young cones blooming with a bluish tinge. It was thrilling to watch mountain bikers below, negotiating the mountain trail at a very high speed, with precision and grace. We could also see young kids being trained on mountain biking skills by their instructors. We alighted at the Roundhouse Lodge after a thrilling 15 minutes. From there we had a 10 minute hike through a trail to the starting point of Peak Express for our journey to Top of the World Summit. The trail had an explosion of colours offered by the wildflowers growing at that altitude. They are seen for only two to three weeks in mid-summer and we were indeed blessed to catch a glimpse of these wild beauties. Most of these flowers are poisonous to ingest, hence are not foraged on by the deer in the forest. The flowers we saw were the Alpine Fireweed, a bright to deep pink flower that grows from 5cm to 3 metres. The yellow Mountain Buttercup is primarily found in deeper soils and among bunch grasses of undisturbed grasslands. The flower has a waxy sheen to it. The Sitka Valerian grows in moist alpine meadows with flowers that are pale pink to white and form a dense, sweet scented cluster. Partridge Foot grows in wetland areas. This shrub-like perennial has cream-coloured flowers in the summer and golden seed pods in the fall. 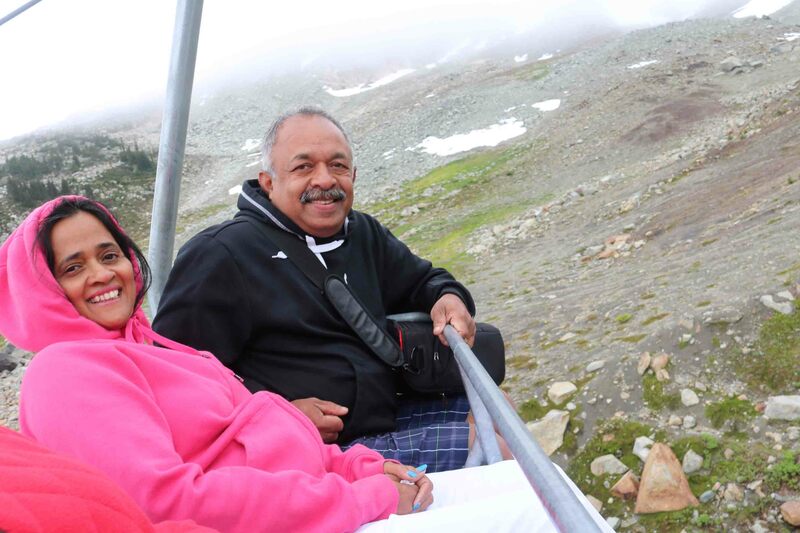 The Peak Express journey was on an open gondola and the cold winds blew hard on to our faces. As the elevation kept increasing, the landscape kept changing. It was a fantastic experience to view the rugged beauty of the Canadian Coast Mountains. The wildflower meadows, boulder filled slopes and towering peaks offered a picturesque view. After about five minutes we landed at the summit at about 7200 feet. From there we could catch the glimpses of lakes under distant peaks and massive glaciers, even though there was bit of mist. 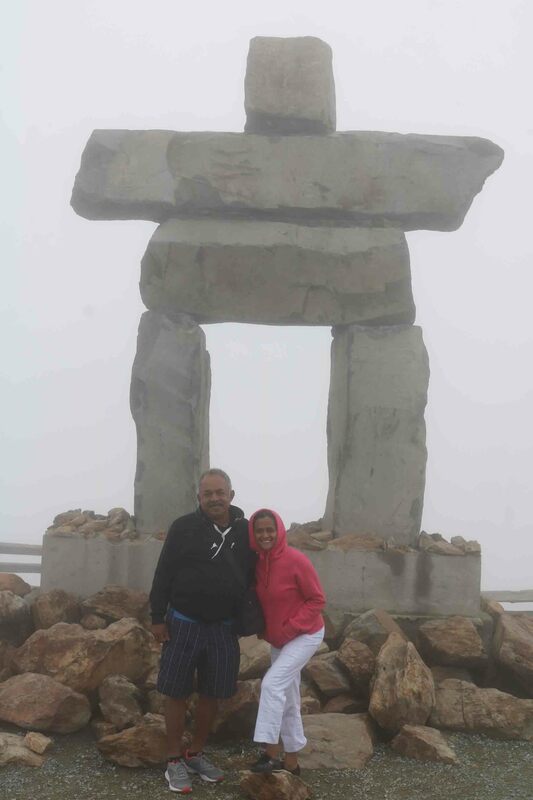 We picked up cups of hot chocolate from the coffee shop and walked to giant Inukshuk. An Inukshuk is a piled-stone marker that looks like a man. Historically it was used in the Arctic as a directional marker but has now become an icon of Canada overtaking the Mountie. After spending about 15 minutes at the summit, we returned to Roundhouse Lodge on the Whistler Mountain for our ride to the Rendezvous Lodge on the Blackcomb Mountain by the Peak2Peak Gondola. This ride was for 11 minutes and the system holds the record for the highest and longest unsupported cable car span in the world of 3.024 km. It is indeed an engineering marvel – a long steel ropeway hanging between two peaks – unsupported by any pylons. The Peak2Peak Gondola was completed on December 12, 2008 and can transport 4,100 people per hour between the resort’s mountains. The cars for this leg of the ride are enclosed and can seat 12 persons. There are some glass bottom gondola cars, but their frequency is once every 15 minutes. The ride offers spectacular views of the village, valley and surrounding mountains – a 360 degree 3D view in fact. From the Rendezvous Lodge we took the Solar Coaster Express and then the Wizard Express to reach the Blackcomb Base. The open-air chairlifts on these rides offer a unique experience than what a gondola provides as you get an aerial perspective of the ground directly below. 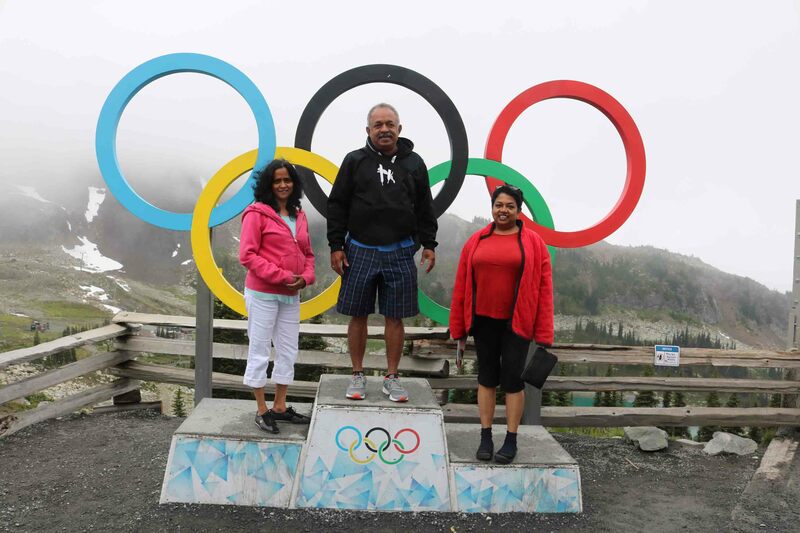 The Whistler Olympics project took nearly four decades, but the effort taken by the Canadian government in collaboration with business partners is clearly visible. It has helped to place Whistler as an excellent year-round adventure destination in the world and has generated employment for the local population and businesses. The Whistler visit showed us as to how the facilities created for a major sporting event could be exploited for the betterment of the community post event. Very educative Col Reji! What an adventurous life you are leading! Reji very beautifully narrated… Man you really bring the events and places to life. Proud of you Eagle.